I have decided to stop any and all complaints about there being no fall season in Austin. This is because I walked outside yesterday and found that my basil plants had reacted quite positively to the rain that finally fell the other day. 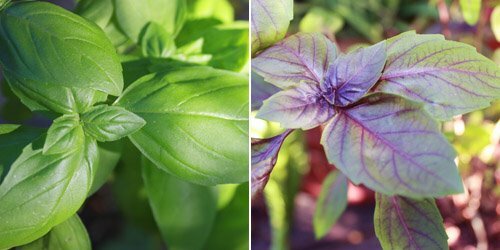 And, thinking back to last year, my basil plants were still alive and kicking at Christmas time. For me, that’s an adequate tradeoff for the lack of fallness. This abundance of basil might have been used for a pesto, but I decided to go even simpler with it. In Vegetable Harvest , by Patricia Wells, a few different herb oils are described and used in salad dressings, and the process for making them couldn’t be easier. Here, two cups of basil leaves are dropped into boiling, salted water for 15 seconds, then plunged into ice water, and then drained and dried in a towel. Placing the leaves in a sieve that will fit into the pan of boiling water and the bowl of ice water makes this procedure even simpler. Patricia Wells lists an exact amount of salt to be added to three quarts of boiling water because salted water helps set the color of the leaves. I note this because I often cook with less salt than is recommended, but in this case, there seems to be good evidence that the right amount matters. 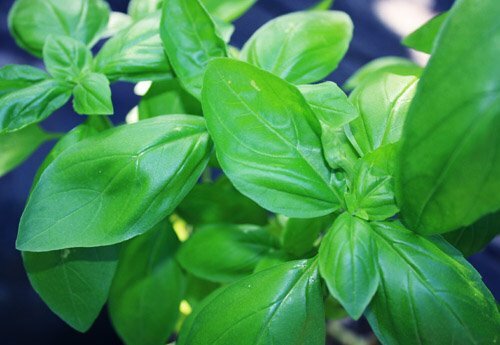 Once the basil leaves are dried in a towel, they join one cup of olive oil and a little sea salt in the blender. Wells suggests leaving the pureed oil as is while other herb oil recipes mention straining it. I don’t mind tiny bits of basil in the oil, so I left it unstrained. In Vegetable Harvest, the basil oil is used in a lemon-basil dressing which is made by combining 1/4 cup of the oil with one tablespoon of freshly squeezed lemon juice. That will be my first use of it, and I already have a few other ideas too. I have no more basil left in my garden! It's getting cold here in the east, and all the leaves are worthless on my plant! Luckily, I froze lots of pesto. Your basil oil looks beautiful! Thanks! This might the healthiest basil I've ever had. I can't believe there were no chewed up leaves on the plants. great idea! and i agree: your basil looks picture perfect. Lyndsey: This oil can be kept in the refrigerator for 10 days. You'll want to set it out and let it come up to room temperature before using it. 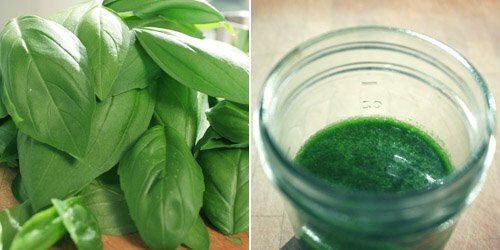 For longer storage, you could make a basil pesto and freeze it. Your lemon basil sounds great!